This was our annual general meeting. KSA welcomes sports enthusiasts to come out and socialize with others with similar interests at our informal monthly dinner meetings. If you're involved in one - or more - of the local minor sports groups or want to become involved with one, these events offer a great opportunity to learn about the local minor sports community. 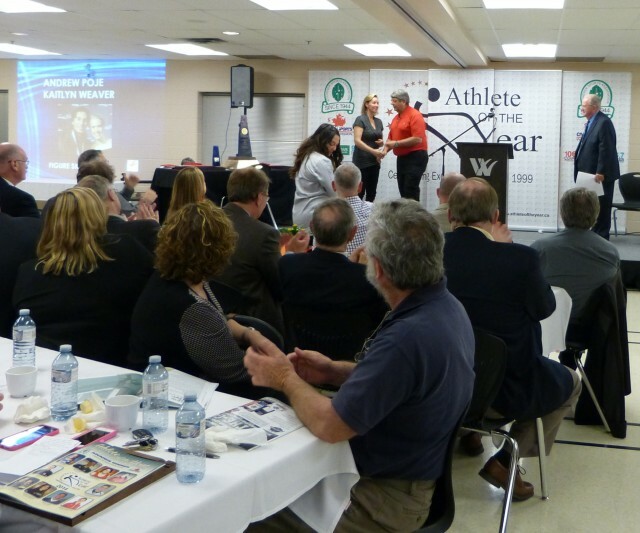 PHOTO: Dinner attendees at KSA'a Athlete of the Year dinner held May 20, 2015. This was a KSA "business" social - a great opportunity to come out, mingle with members of the local minor sports community and learn about KSA's funding programs. Attendees had the opportunity to learn about each other's programs - and KSA's! Lots of opportunities to work together - new facilities? equipment? fee-assistance? - and a great meal to boot! January dinner date & details (To be confirmed) Rangers dinner - new coach! Dates, rates and details on these dinners are subject to change depending on the Rangers schedule for the 2015/16 season. More information on our February, March, April (Scholarships) and May (Athlete of the Year) dinners will follow when details are finalized. Those wishing to prepay for all 8 KSA dinners may do so by paying $200. This reserves a spot at all the dinners for any designated representative (may have different representative at each dinner).